It’s not news that the way that decision makers are making big purchasing decisions has changed. The buying (and consequently selling) environment has evolved into a longer, more complex process. This is no exception in the healthcare industry where big purchases are far more common. Because people are armed with more information than ever before, they have become sophisticated, educated buyers that are more skeptical about making decisions. Most decision makers are already more than halfway through the decision-making process by the time they speak to a sales rep thanks to their own savvy research. How can your business combat this challenging sales environment? The way that healthcare decision makers buy has prompted a new approach to the way that businesses sell to them. We outline some of the most important aspects to include in your sales and marketing strategies in order to close more deals and navigate through this complex landscape. 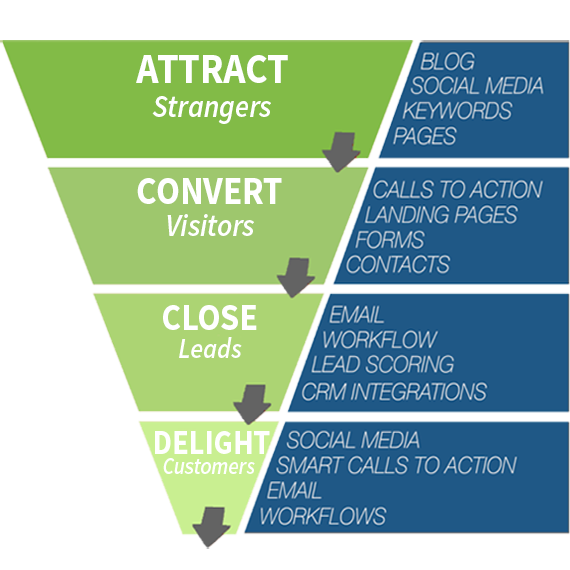 The answer to A. generating more leads and B. closing those leads lies in digital marketing. Digital marketing has been slow to enter the healthcare space, but it is advancing nonetheless. While patients may be going online seeking care and comparing providers, healthcare decision makers (such as hospital administrators) are also relying on search results to yield the best solutions to their problems. Here’s how to make waves in the industry and ramp up your healthcare marketing strategy. Disclaimer: we don’t want to seem to place an overwhelming amount of importance on these next two tips, but they are part of digital marketing in any industry and thus must be mentioned. Refer to disclaimer above. While we don’t recommend going out and purchasing a bunch of Google AdWords or spending all of your time trying to rank for keywords, there is some attention that needs to be made to the power of search engine ranking. Most obviously, if your customers can’t find you, how are they supposed to buy from you? Ranking for keywords that your buyer personas are likely to search for is one strategy to get in front of them. And as the Google and HIMSS’ study shows, if 90% of the hospital administrators surveyed are using search engines to research vendors, then being found online is pretty important. Let’s look at how you get found online in ways that revolve around your buyer personas. If SEO is what you need to achieve to get find, content marketing is how you get there. Research from the Content Marketing Institute shows that healthcare is at least two years behind other industries when it comes to content marketing. It’s time to catch up. 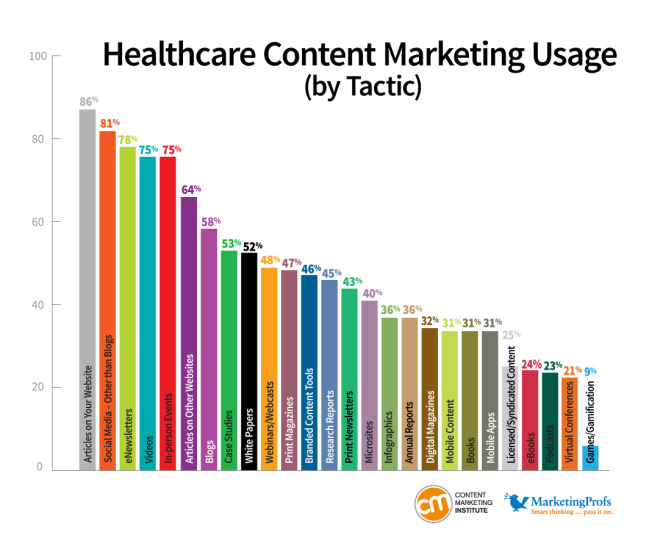 Here is the breakdown of content types in the healthcare industry. Don’t forget about social media. Social media is a powerful tool for prospecting, networking, and getting in front of your buyer personas. Someone on your team should constantly be monitoring, posting, sharing, and commenting within various social media platforms (primarily LinkedIn and Twitter) to drive traffic and generate leads. Read our guide here about getting started on LinkedIn. While all of these types of content are important for various parts of the buyer’s journey, videos are becoming increasingly important in digital marketing—especially in the healthcare space. In the Hospital Decision Makers Study, results showed that every buyer watched videos for product demonstrations, and more than 60% watched online procedures and videos comparing products. Their research also showed that videos prompted decision makers to act. “After watching a video, 79% continue on to the manufacturer’s website for more information, and 63% talk to others about the information”. Videos should be short and to the point. Read about the different types of videos you can create here. What does a strong healthcare marketing strategy mean for you? None of what we just explained should come as a surprise to you. Digital marketing is here and it is only expanding its reach. It is allowing decision makers to become more educated buyers than they ever were before. And in an industry as complex as healthcare, being at the forefront of innovation is a must. Revamp your sales and marketing strategies to stay competitive in the new healthcare landscape. Want to learn more about LeadGen in this increasingly complex environment? Download our LeadGen eBook below!